Bakchich has been on my list since it opened. I'd seen their sister restaurant in Liverpool a few months earlier, so was suitably chuffed when I heard they were coming to Manchester. I've been eating out left, right and centre recently, but this week finally made time to visit. It's set just off Oxford Road, near the Humanities block at Manchester University. Incidentally, this is where I did my degree. Imagine if this had been there when I was? I'd have been (more of) a disgrace. In my day we had a Gregg's, which already led to an unhealthy obsession with Belgian buns. Thinking about it, I lived off those and Cadbury's Tasters, with the occasional packet of strawberry Chewits thrown in. We walked in from the cold to be greeted by lovely Sam; a genuine delight, who was keen to get us away from that nip and to a warmer spot at the back of the restaurant. We were pretty sure we loved him already. 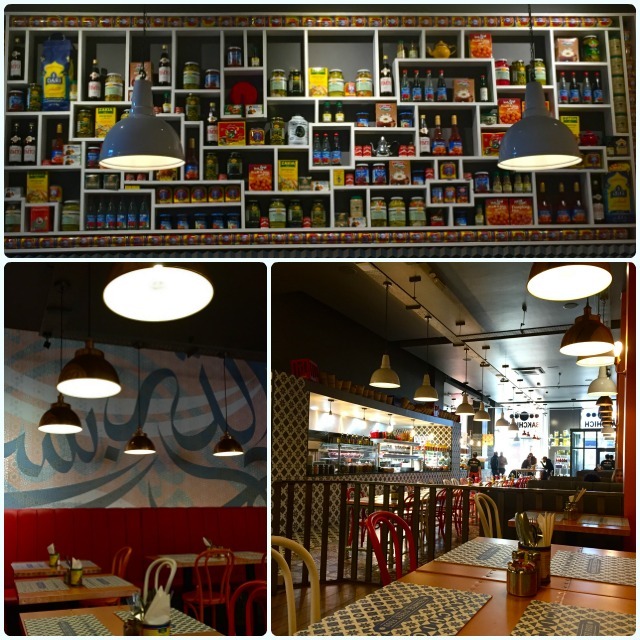 The restaurant itself is a pretty mix of bright furniture, beautiful tiles and numerous packets and tins of exotic looking food. The kitchen is open, which allows you to see the culinary wizardry being conjured in the back. Bakchich don't serve alcohol, but we really didn't miss it, despite both having spent a busy morning in work and being partial to a lunchtime cocktail. 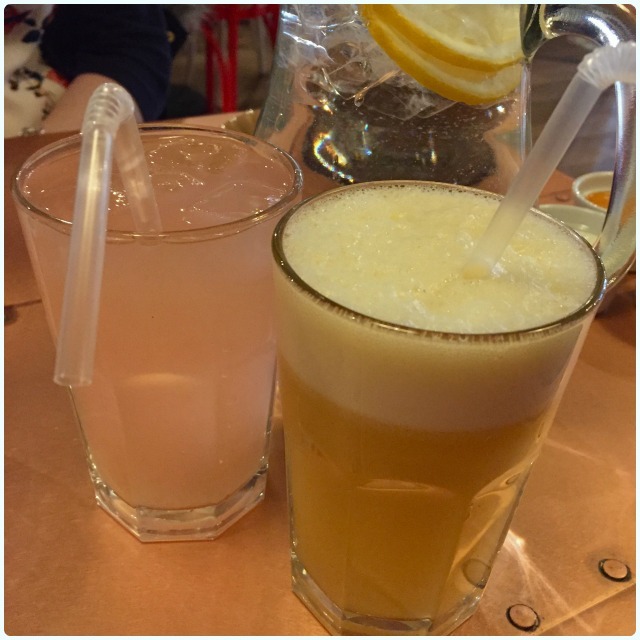 Roza lemonade - lemon, line and rose water: These were our favourites! Slightly fizzy with a subtly hint of rose. We stayed on these. Apple, lime and ginger juice: Very refreshing with a little warmth from the fresh ginger. 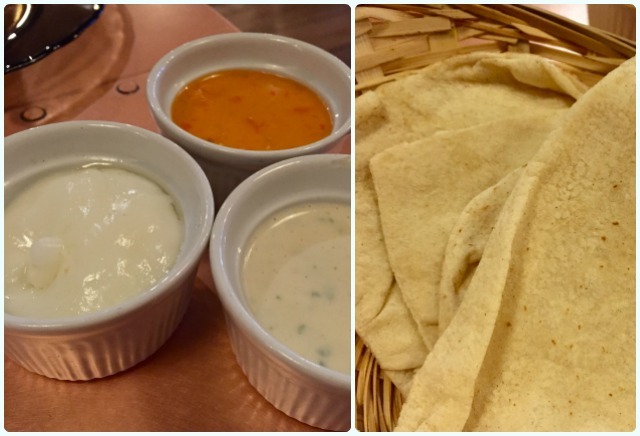 Bread and dips: We were starved by this point, so soft warm flatbreads were most welcome. That garlic mayo is just gorgeous. Fairly sure I still stink of it now, but I care very little, as it was totally worth it. 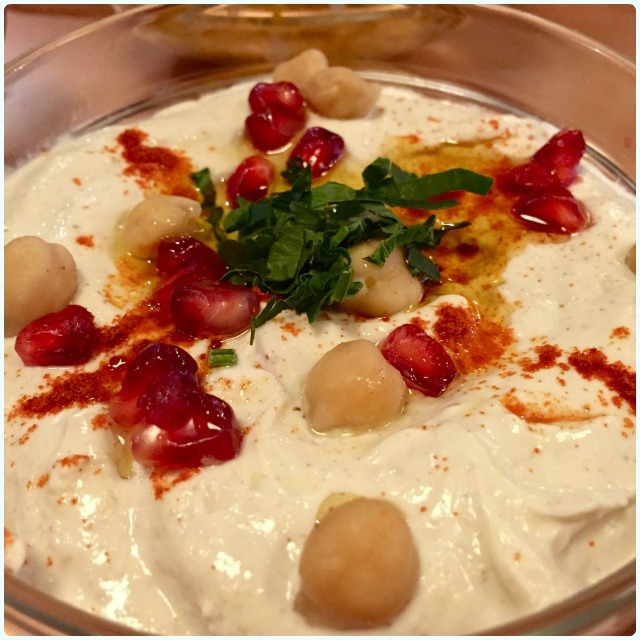 Hommous Beiruty: Thick and creamy with sweet pomegranate seeds. Great for slathering over falafel, just saying. 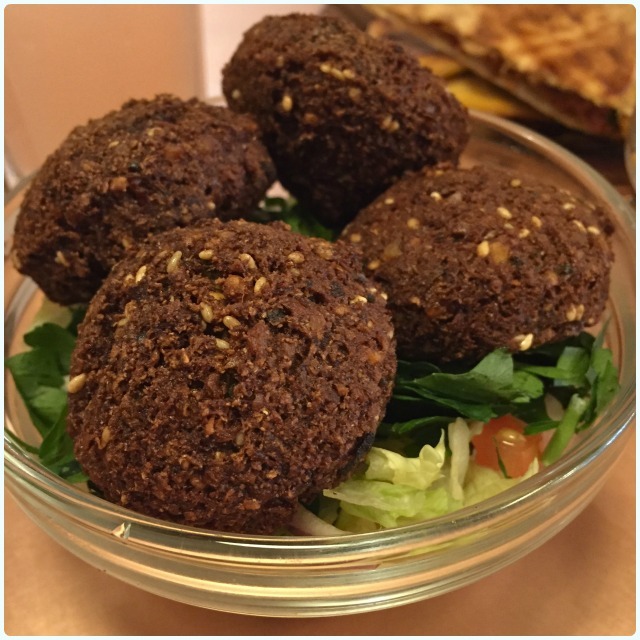 Sweet potato falafel: How lucky that was! Another dish where pictures don't do it justice. A nice change from the standard type, and something the staff are obviously very proud of. You must try these with a big old pile of assorted dips. 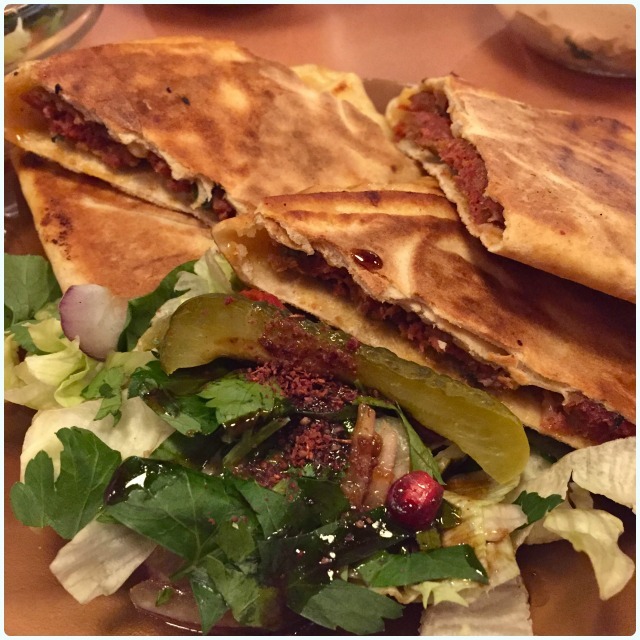 Bakchich Arayes: One of the standout dishes for me. They are described on the menu as pastries, however they are more like a thin, filled flatbread than a pasty style item (I had imagined something Cornish looking). Get this dipped in you hommous. The pickles deserve a separate mention; pickle fans, get involved in these! 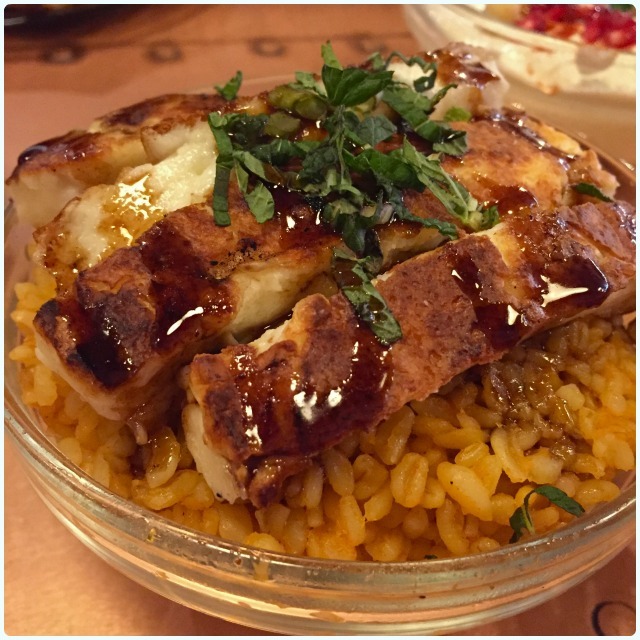 Bourkouri halloumi: One of my other favourites. I can't get enough of halloumi. Served on delicate tomato bulgur wheat, this soft cheese had managed to avoid the 'squeak overload' you sometimes get when it's slightly overdone. I'm having this again. 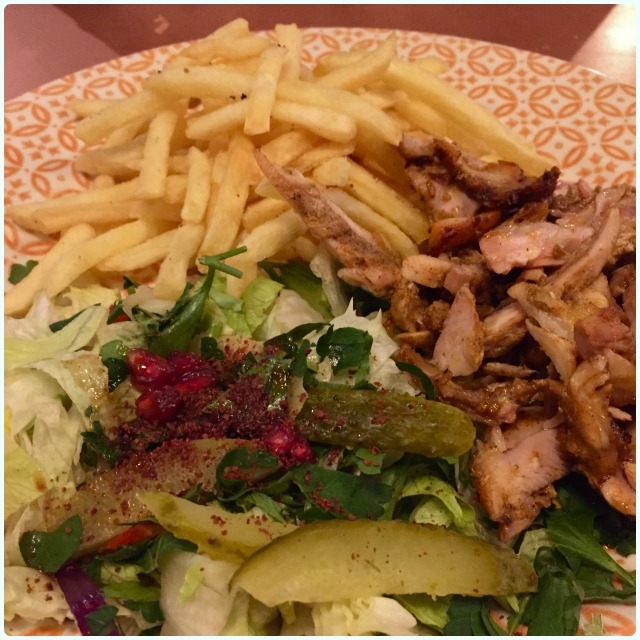 Chicken shawarma platter: Basically this is strips of chicken, roasted on a spit like doner meat. It means it's incredibly juicy. The chips are pretty good too. 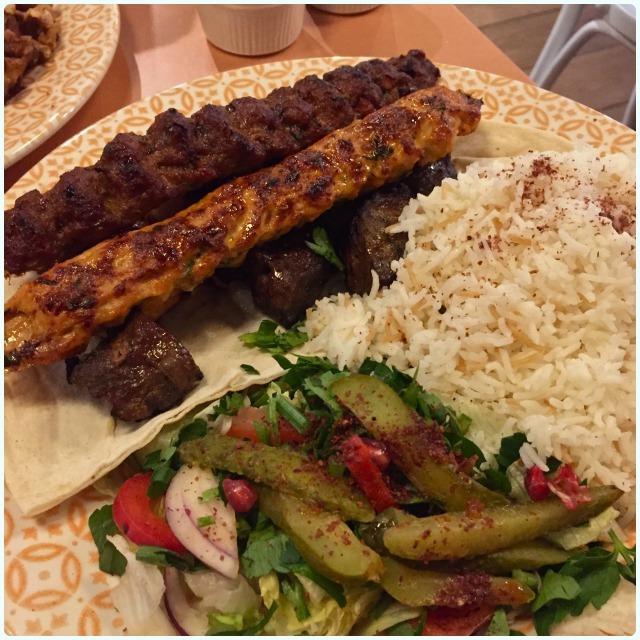 Mixed grill meshawi: Amazing if you're incredibly indecisive. 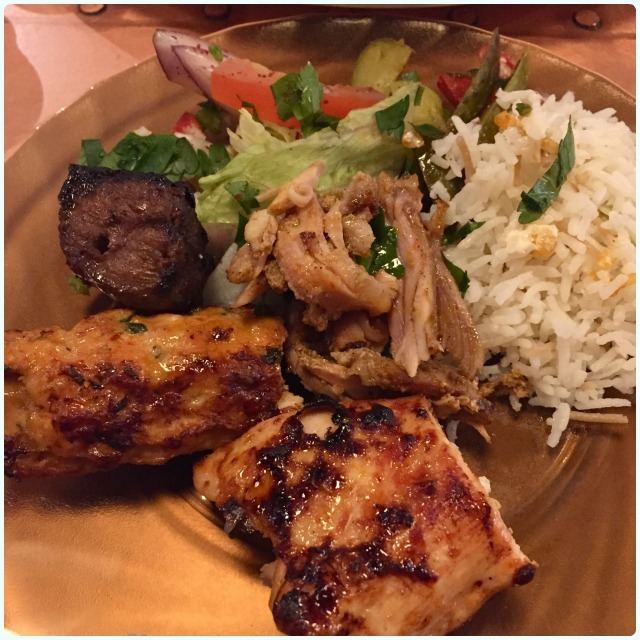 There are four kebabs, including shish, taouk, lahma meshawi, kefta meshawi and chicken kofta. As much as I thought all of them were fantastic, the taouk (chicken skewers) were my favourites, owing to the charred edges. The picture below looks like a rather civilised and sensible plate of food. This was round one! By the end of the meal, we had rice all over the show, and had consumed way too much. We were so happy! Then our lovely waiter asked us whether we had room for dessert. We did not, but went with it anyway. He explained that all the desserts are home made in the Liverpool restaurant, then sent over to Manchester, thus the cheesecake being in a little plastic pot. 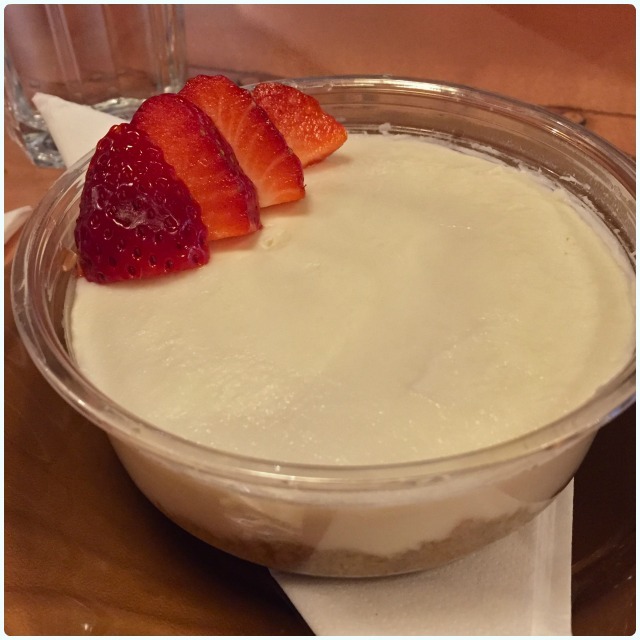 Lebanese coconut cheesecake: So light and creamy, with the subtlest hint of coconut. Almond and pineapple cake: This one wins! I'm a sucker for anything with almond in it. Holy moly this is good. I don't care if you think you're full. 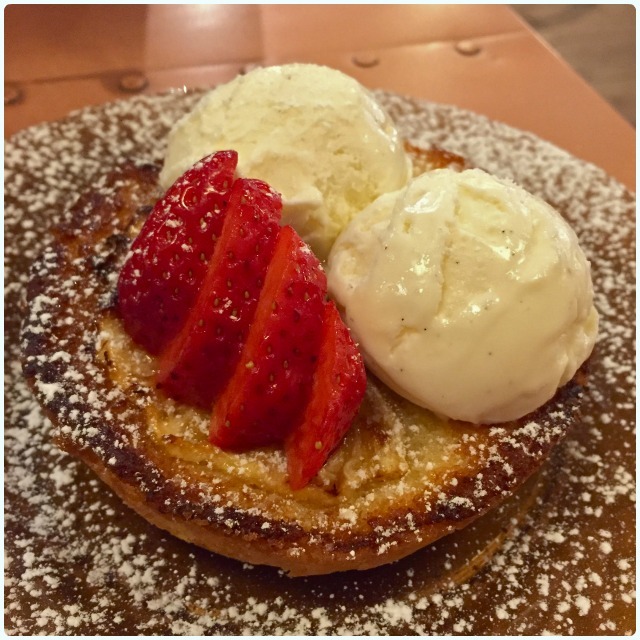 Get a grip and revive your lethargy with this sugar fuelled beauty. Perfect in every way. 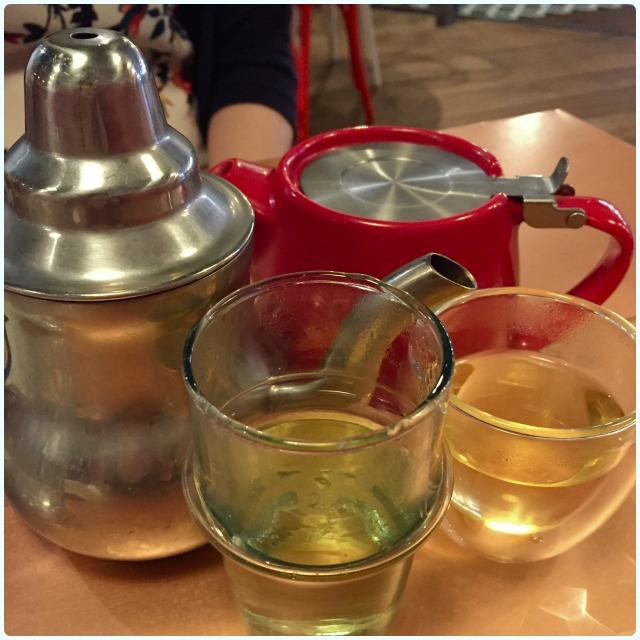 Teas - Moroccan mint and Lebanese: We were persuaded to have tea by the wise waiter who saw we may be unable to vacate the premises without assistance. He assured us that it would aid digestion and bring us back to the land of the living. 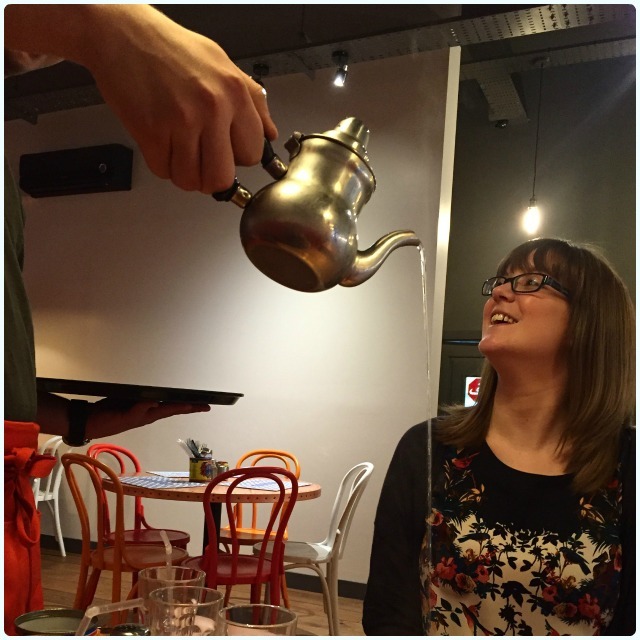 Lee had mint whilst I went for the Lebanese blend, poured from a terrifying height. I can't say enough nice things about the soothing quality of Lebanese tea; a warming brew of rose water, zaatar and cardamom. Try it. Note: no-one had tea poured onto their crotch, this is just an unfortunate angle where Lee managed to get her tea loving mug in the shot. If you love lots of bits, genuinely adorable staff, and saying 'ooooh' a lot, go to Bakchich. You won't be disappointed. 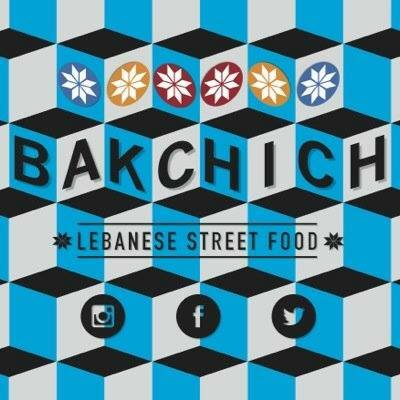 Disclaimer: Lee and I were asked to go to Bakchich to check out their new restaurant. I was not paid to say anything nice, befriend their staff, or threaten to move in. However, I did find out that the food is wonderful, and if things get too much, there is a bed upstairs. Thanks Sam.